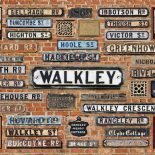 Walkley Historians have been working on a new exhibition – all about crime and punishment in Victorian Walkley. The exhibition leads us through the crimes, police, juvenile delinquents, fraudsters and boisterous butchers of the 19th century. It is written by Hugh Waterhouse and based on his own research. The exhibition will launch in Beeches of Walkley on Saturday 23rd June for the start of the Walkley Festival. It id displayed on two sides so you have to go into Beeches to read the second half, which includes the incredible story of the Baron of Walkley. To celebrate the new exhibition Walkley Historians will be at Walkley Carnegie Library to share their discoveries and answer questions, and we will publish Hugh’s Crime and Punishment talk as an online audio podcast on this website – both on the 23rd June. This entry was posted on June 13, 2018 by Bill Bevan in Uncategorized.